A team of researchers at the Allen School and University of Washington Department of Electrical Engineering have invented a long-range backscatter system that enables low-cost connectivity for a variety of objects and devices while consuming 1000x less power than existing technologies. The new system — which builds upon pioneering work by members of UW’s Networks & Mobile Systems Lab and Sensor Systems Lab on techniques for harvesting power from ambient signals — is the first of its kind capable of achieving the distances required for wide-area communication and truly ubiquitous connectivity. Long-range backscatter works by reflecting radio frequency (RF) signals onto sensors that, in turn, synthesize and transmit data packets that are decoded by a receiver. 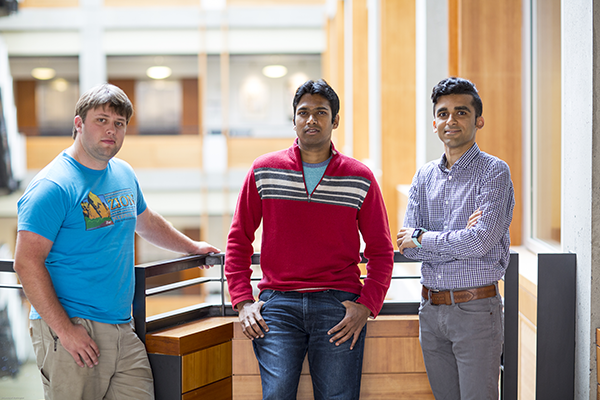 To expedite adoption, Gollakota and his colleagues — Allen School and EE professor Joshua Smith, director of the Sensor Systems Lab; former Allen School postdoctoral researcher and EE Ph.D. alumnus Vamsi Talla; Allen School Ph.D. student Mehrdad Hessar; former EE Ph.D. student Bryce Kellogg; and current EE Ph.D. student Ali Najafi — took into account form factor and cost when designing the system. The efficient and unobtrusive sensors, which are capable of drawing what little power they need from ultra-thin printed batteries or from ambient sources, cost as little as 10 cents apiece. The system also relies on readily available commodity hardware for the receiver, rather than a custom design. The researchers had to overcome some technical challenges. To ensure the receiver could distinguish the backscattered reflections from the original signal and other noise, they introduced the first backscatter design employing chirp spread spectrum (CSS) modulation. This approach enables the reflected signals to be spread across multiple frequencies for greater sensitivity over long distances. They also developed the first backscatter harmonic cancellation mechanism to cancel out sideband interference, and a link-layer protocol to enable multiple long-range backscatter devices to share the spectrum. The researchers are presenting their research paper at the Ubicomp 2017 conference this week in Maui, Hawaii. The team envisions a number of ways in which the technology could be used, from precision agriculture and smart cities, to medical monitoring and whole-home sensing. To demonstrate the system’s reliability, the researchers deployed long-range backscatter in a variety of real-world settings. These included a 4,800 square-foot multi-story house; a 13,000 square-foot multi-room office space containing wood, concrete, and metal; and a working vegetable farm spread over one acre. They also built prototypes of a smart contact lens and flexible epidermal patch to illustrate how long-range backscatter will enable new capabilities in wearable technology. The future of ubiquitous connectivity envisioned by the team may not be far off. 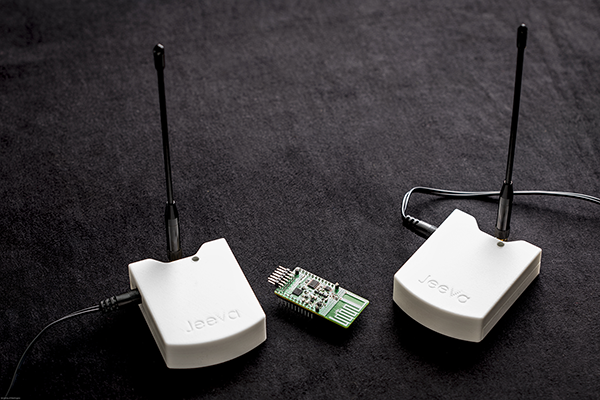 Jeeva Wireless, the UW spinout co-founded by the researchers to commercialize backscatter-related research, aims to bring the long-range backscatter system to market within the next six months. To learn more about long-range backscatter, read the UW News release here and visit the project page here. Also check out coverage by The Economist, GeekWire, and Engadget.